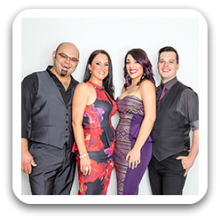 Canberra Band 127 – This multi-talented band works with you to create an ambiance that distinguishes any special event to create a unique and memorable occasion. When performing, the members of the Canberra Band 127 integrate fine musicianship with artistic creativity to deliver exceptional performances which has gained them a high reputation for first class entertainment. Canberra Band 127 is a sophisticated 4 piece line-up featuring live guitar instrumentation, 1 male and 2 female lead vocals, and further backing vocals to give the band the strong, rich four-part harmony sound that feature on most of their songs. Only a minimal amount of space is required for set-up, making it the perfect format for almost any event. With a small sound system and minimal amount of equipment, the set-up process is quick, clean and very professional. The overall volume is controllable to your liking. For small rooms, Canberra Band 127 can play quieter than larger bands, whilst still having the ability to fill a larger room with sound if necessary. The musicians feature as one of the most reputable, professional and hard working live acts serving the local and surrounding regions for over 18 years. Each artist has over 15-20 years of performing experience and is dedicated to providing a quality, professional musical service. Canberra Band 127 plays a mix of musical favorites from every era with an emphasis on high energy dance music. Constantly improving and expanding their repertoire, Canberra Band 127 will arrange any musical selection upon request including the latest releases. They are able to obtain a sound unbelievably close to the artist they cover “as quoted by the people”. Whether you’re looking for corporate entertainment, a premier wedding band or a head turning live performance, Canberra Band 127 is the right band to impress the most discerning critics. With extensive experience playing to live crowds, Canberra Band 127 is able to connect with the audience by feeling the mood of the crowd and tailoring their repertoire to meet the vibe of the event. Can perform as a: 4 Piece Band and are available to perform in Canberra and Surrounding Areas.